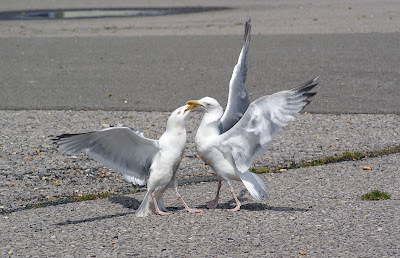 Herring gulls Larus argentatus, photographed by Ricky. The genus Larus as used here includes the majority of the gulls, long-winged, relatively short- and stout-billed generalist wading birds found worldwide. Though primarily associated with coastal habitats (as indicated by their webbed feet), many gulls can also be found great distances inland. Most gulls are grey or white in colouration, often with some degree of darker colouration on the wings and back. [S70] Schnell, G. D. 1970. A phenetic study of the suborder Lari (Aves) I. Methods and results of principal components analysis. Systematic Zoology 19 (1): 35-57.